Can create USB drive bootable. Cannot burn other ISO’s exclusive for Windows 7 ISO only. Sometimes failed to create bootable USB drive. Windows 7 USB DVD Download Tool is a free Microsoft product used solely for burning Windows 7 ISO products. It’s light and with a very simple UI (user interface). This tool helps you burn all Windows 7 ISO versions to DVD and USB drive without the need to use expensive burning software. Download Windows 7 USB DVD Download Tool. Run the Windows 7 USB DVD Download Tool installer as “Administrator“. Then follow the installation wizard’s instruction until it’s completely installed. If you are having issues please download Microsoft .NET Framework version 2.0 or later here. Still using Windows XP? You need to download Microsoft Image Mastering API v2 here. Windows 7 (all versions) XP SP2 and Vista (32-bit or 64-bit). Recommended processor speed is 300MHz but Pentium 233-megahertz (MHz) may be good enough. Blank DVD-RW, DVD-R or USB Drive with at least 4 GB capacity ( bigger is better). What Windows 7 USB DVD Download Tool can do? Burn your Windows 7 ISO’s all versions any binary digit. Can make your USB Drive bootable. Can be used to back up your Windows 7 ISO to a Blu-ray Disc provided that your DVD writer is capable. You cannot burn any ISO files except Windows 7. You cannot use it to burn Windows 7 ISO and use it to other computer unit. It is only intended to your licensed PC (technically, you can, but you need another license to make your new installation legal) . If you are fond of Dual-layer DVD discs then sorry Windows 7 USB DVD Download Tool, doesn’t support it yet. Bootsect error – This error may occur if you are creating 64 bit bootable Drive from a 32 bit Windows 7 OS. Solution: Download Bootsect.exe follow the detailed instruction here. “We are unable to copy your files. Please check your USB device and the selected ISO file and try again” error. Solution: I found this quite unusual because I was able to complete the ISO burning process using DVD. 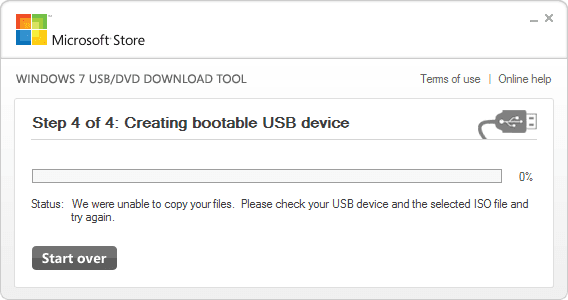 However, when I tried to create bootable ISO in USB device, it cannot complete the process. This might be because I am still using USB 2.0 port and Flash drive or my Pen drive is just old enough. If anyone of you tried USB 3.0 Flash drive on USB 3.0 port and successfully created a bootable USB drive, please drop a comment below. It will be highly appreciated. Sorry if I did not try USB 3.0 Flash drive, I don’t have the resources to do it as of the moment. Honestly, I am tempted to buy one. However, I don’t feel the need to do so, with ten (10) 2.0 Flash drives in my hand, I will just make use of it. So, my solution is I use Rufus as alternative. Have you tried Windows 7 USB DVD Download Tool? Share us your view. Did you encounter any error while creating bootable ISO? What is it and how did you solved it? Your input will be highly appreciated.